Happy Belated Birthday to CANDY MAN! Could not BELIEVE I forgot about Orpik’s birthday today. I mean how could forget about Candyman’s birthday? Anyways, Orpik turned 28 yesterday. Happy effin birthday to him. 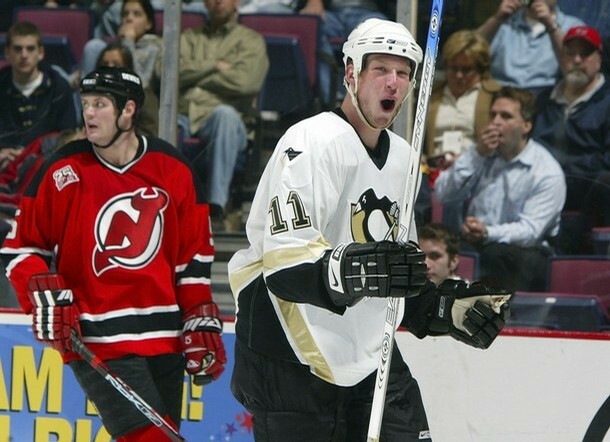 Very, very happy that Brooksie will be in a Penguins uniform for a many more seasons. He had a solid year this past year and is in his prime now. Hopefully he can keep dishing out the hits (and some candY) and hey, maybe chip in a goal or two every once in a while? I know, I know…too much to ask but hey, it COULD happen. Oh man, what an EPIC video. Gotta love it! Completely forgot about this until someone over at LGP started a thread wishing Staal a happy 20th birthday. Anyways, another one of our youg’ens just got a year older with Staal turning 20. It’s sort of amazing that Staal has a 25+ goal season and plays solid defense BEFORE turning the age of 20 under his belt. A lot of people ripped him last year for having a sophomore slump (I’m guilty it) but some need to realize he was only 19 freakin’ years old! Most admiring NHL players would LOVE to get the chance to start on an NHL team at 18 or 19. Instead Staal was playing for an elite team and picked it up more in the second half of the year. On most teams he’d probably be a 2nd line centerman and in the future he should be a very good 2-way center (though I doubt he’ll be with the Pens unfortunately). Like Crosby, Malkin and Fleury, Staal is still growing and his ceiling his pretty high. Hopefully he gets more time with Malkin this year so he continue to grow and hopefully stick with the Pens for a while. I’ve got a good feeling about Staal this year. The sophomore slump is behind him and I think he’ll go back to the way he used to play, especially if he plays with ‘Geno on that second line. That’d be pretty huge for the Pens if he can be even close to the goal scorer he was during his rookie season. To have that scoring coming from him possibly on either Malkin’s or on the third line would make our depth much deeper. DO IT! Hey in one year from now Staal will be able to have his first drink…oh wait. 21 years ago today, the one, the only, Sidney Crosby was born and has changed Penguins fans life….FOREVER! August 7th, 1987, Troy Crosby and Trina-Forbes Crosby gave berth to young Sidney in Cole Harbour, Nova Scotia. As he grows older, the vision of him being “Sid the Kid” starts to fade. Well 21 years Crosby is becoming a MAN. He is no longer a ‘Kid’ anymore. He’s matured into a very fine young man and an awesome hockey player to boot. You are currently browsing the archives for the Penguins Birthdays category.